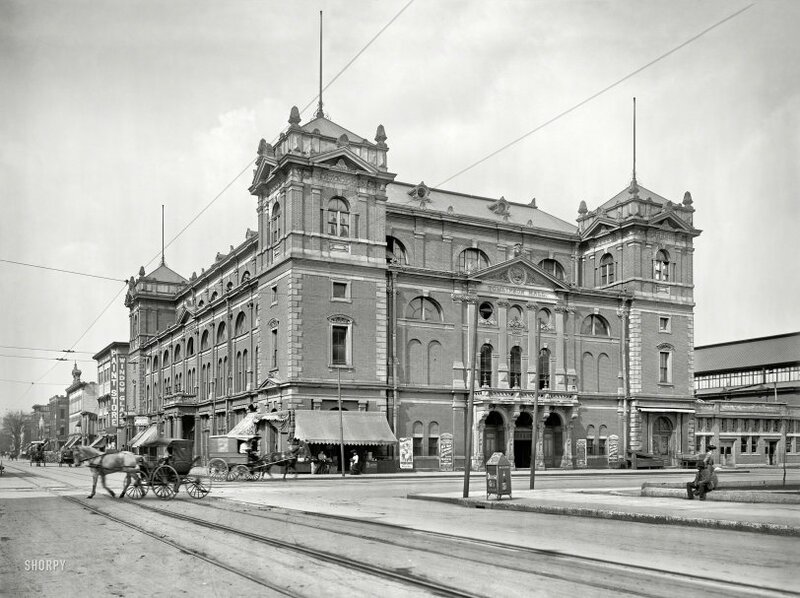 Demolished in 1958 after being gutted by a four-alarm fire. Indianapolis, 1904. "Tomlinson Hall, Delaware and Market streets." Continuing our visit to Indiana's capital city, with the second "Omega Oil" waste bin in as many days. 8x10 inch glass negative, Detroit Photographic Co. View full size. Submitted by 510Russ on Tue, 07/17/2018 - 7:49pm. Two parts of Tomlinson Hall remain today. Around the corner to the right of the building is an archway that still stands. Also, its basement with vaulted ceilings (called "The Catacombs") is below today's plaza.